I've been polishing Bee Aware! for the last two months, and am rounding up the last bits. A new demo has been uploaded, together with new screenshots (new video's will follow soon). Bee vs Mites (a topdown scroller) has been upgraded, and now includes realistic, thick smoke effects, water and leaves effects, a smoother gameloop and a boss level. 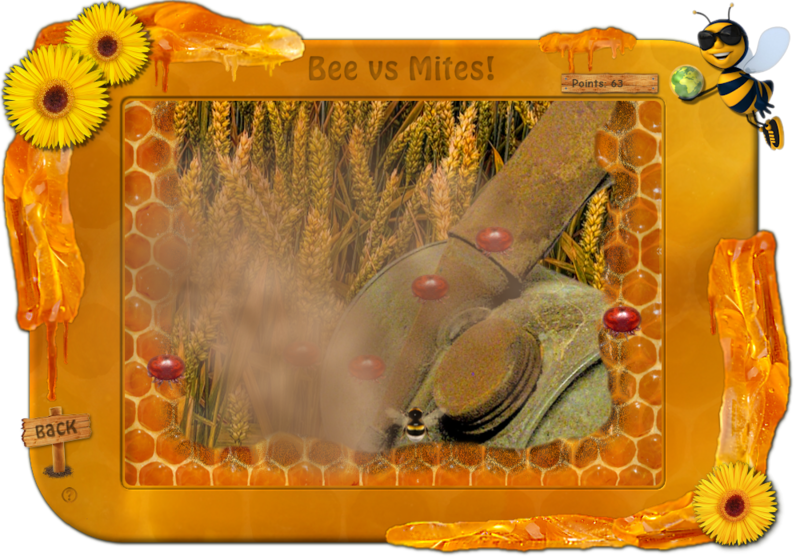 Bee vs Mites is playable from the demo, as is Bee Puzzled (jigsaw game). The playable bee now has animated wings. Improved interface for the quizzes (Bee Smart - 5 quizzes, 20 questions each). A set of 18 new card foregrounds and 75 new images (total 150) for the memory game (Bee Remembered). New (small) end animation for Bee Remembered. Added a ghost to Bee Amazed (maze game). If it catches you, you're forced to solve an equation (the ghost used to be a teacher). New (small) end animation for Bee Puzzled. Added 20 images to the jigsaw game, which makes a total of 50 images. Made 4 themes for Bee't the Bear (puzzle game), summer, autumn, winter and a desert theme. Added three difficulty levels to Bee Fast (arcade game). Implemented a day/night cycle in Bee Fast (I love it when the lights of the tractor and plane are activated). Added a lot of nonsensical text to BB, a bee that talks too much, whichs brings me to a total of 211 silly texts. Improved overall gameplay, cleaned up unnecessary code, improved graphics where needed etc. etc. Added extra achievements for Steam (beat the boss, solve an equation etc. ).